BOTTLE-ROUND-PACKER-009 is a standard round packer bottle typically found on store shelves in Pharmacies. 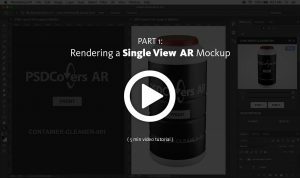 This AR Mockup applies your 2D design on the label area of this straight sided wide mouth packer. 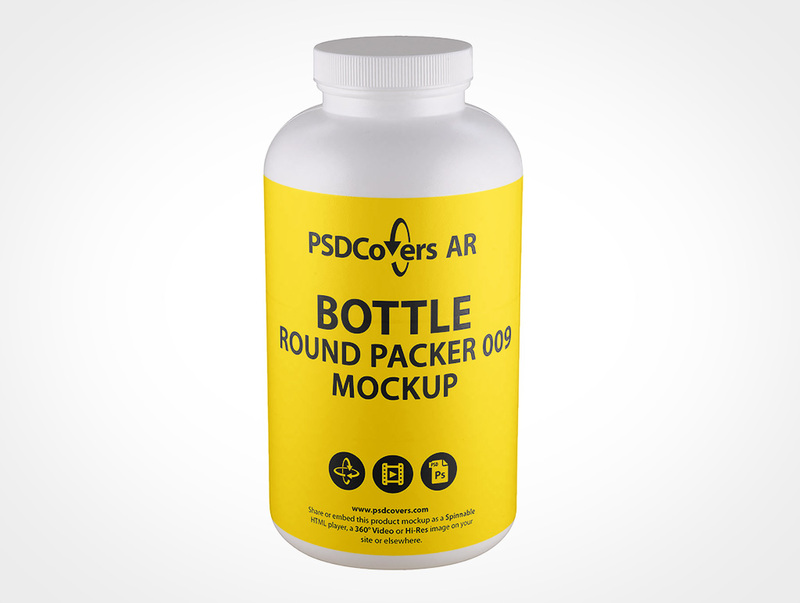 If your project requires a bottle for vitamins or nutritional supplements then mockup fits that requirement. 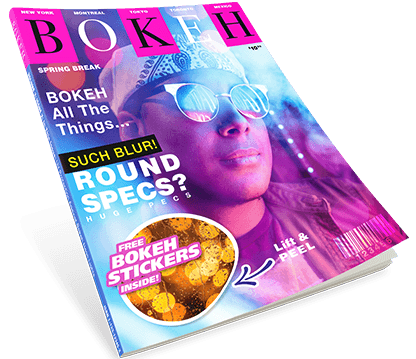 This product is an AR Mockup which you can embed into your own web page. You can spin this mockup by using the sample button on this page. Round packer pill bottles are generally straight sided with a wide mouth. Held in your hand, this 1L product stands 180mm high and 91mm wide with a continuous-thread neck finish under the cap. As a finished product, this packer is made from HDPE plastic high density polyethylene. 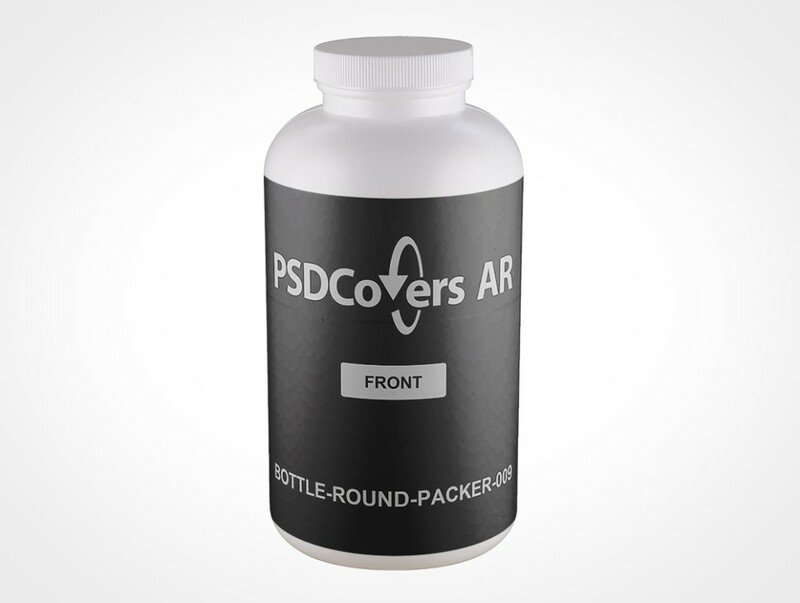 Launch Photoshop, use PSDCovers to pick from one of 168 possible BOTTLE-ROUND-PACKER-009 product angles. In practice, you will just need to create a single template for this straight sided wide mouth packer product which is applied to any selected degree. Whether your defined layout is a spot label, sticker print, silk screening, PS label or wrap label it will be directly applied to the product. Regardless of which view is selected, the prepared sequence is an editable PSD mockup. Feel free to customize the fully transparent background or pick your own or handily select another the colour. Also, replicated product highlights from the light source are provided. Alternatively, you may also produce a 360° movie of this straight sided wide mouth packer or as a spinnable AR experience using our html player. Press the Spinnable Sample button above right to view the BOTTLE-ROUND-PACKER-009.